A new method for mapping Earth's interior shows broad regions under the Pacific Ocean and Africa where magma hotter than its surroundings is floating through the upper mantle and then traveling horizontally under Earth's lithosphere. Some seismologists have called these slow upwelling regions superplumes, but primarily relegated the phenomena to the lower mantle. "Superplumes refer to these two features at the bottom of the mantle, not the hot spot surface expression of narrow plumes," says Barbara Romanowicz of the University of California at Berkeley. "Seismologists don't know yet if these superplumes are large features from one plume or a collection of much more narrow plumes in the sense that geodynamicists think of them." In this week's issue of Science, Romanowicz suggests that the continuation of the superplumes through the mantle may require reevaluating Earth's heat budget from the core and the role upwelling from the mantle plays in the driving forces of plate tectonics. In these broad regions of extra hot magma, seismic waves traveling through the mantle slow down. While previous studies indicated these superplumes traveled high above the core-mantle boundary, "other models of the upper mantle don't show as clearly the relationships between these two superplumes in the lower and upper mantle," Romanowicz says. Rather than using the changing velocity of seismic waves to determine the temperature patterns of the upper mantle, Romanowicz and graduate student Yuancheng Gung studied the amplitudes of these waves. "Seismic waves travel faster through cold and rigid slabs, but travel time — or velocity — is sensitive to chemical composition and in the upper mantle the effects are competing," Romanowicz says. "Temperature distribution blurs travel time signals making it more difficult to interpret." 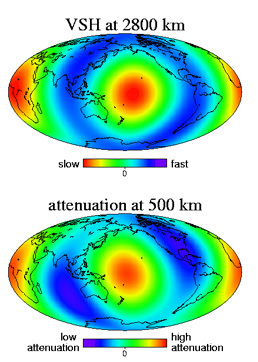 At left, the top map shows seismic velocity in the lower mantle, while the bottom map shows the attenution of seismic waves (a decrease in amplitude or energy) in the upper mantle. High attenuation occurs in areas of high temperature. Image courtesy of Romanowicz and Gung. They produced 3-D maps that showed decreasing amplitudes of the waves, or their attenuation through hotter-than-average material in the upper mantle. "We're using attenuation measurements that are more sensitive to temperature. It measures how seismic waves lose energy as they propagate through hot, soft absorbing material," Romanowicz explains. Linking their maps to previous velocity maps of the lower mantle created a close match. "They show the hotter bits in the lower mantle are beneath the hotter bits in the upper mantle. One is above the other," says geologist Kevin Burke of the University of Houston in Texas. But at some points the flow has shifted in the upper mantle, indicating a change in direction of the upwelling flow. "This is an innovative, comprehensive review on the way in which heat moves in the mantle driving forces for plate tectonics," he says. But the role these hot areas play in perpetuating the cycle of plate tectonics is itself a contentious sticking point for modelers. "Geodynamicists say the most important feature in mantle driving convection pattern is the cold slabs falling into the mantle and displacing material," Romanowicz says. "They consider the return flow that rises a passive return flow. We think because these features are strong and continue through the mantle that they must be putting energy into the system. Some heat from the core is basically driving the upwellings." Gerald Schubert of the University of California in Los Angeles is skeptical of Romanowicz's findings, calling the comparison between the attenuation of the upper mantle and the velocity of the lower mantle a tenuous connection. Because seismic velocity measurements come with differing interpretations, a better comparison would be "attenuation throughout the mantle and show the connection between the upper and lower mantle this way," he says. "Then you could significantly say when you measure attenuation you have a stronger case to interpret measurement in terms of temperature."